Porous, very light weight mass of matted, partially decayed organic fibers. Peat forms when plant material accumulates in an anoxic environment where decay is inhibited. Typically this is in marshes and bogs associated with deltas, flood plains, tidal marshes, etc. 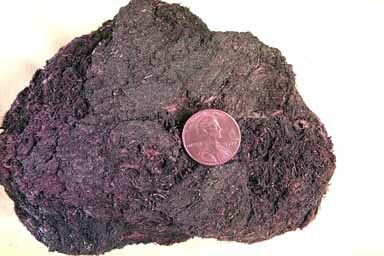 If it becomes progressively buried and heated it can eventually turn into bituminous coal, then anthracite coal, and finally graphite.